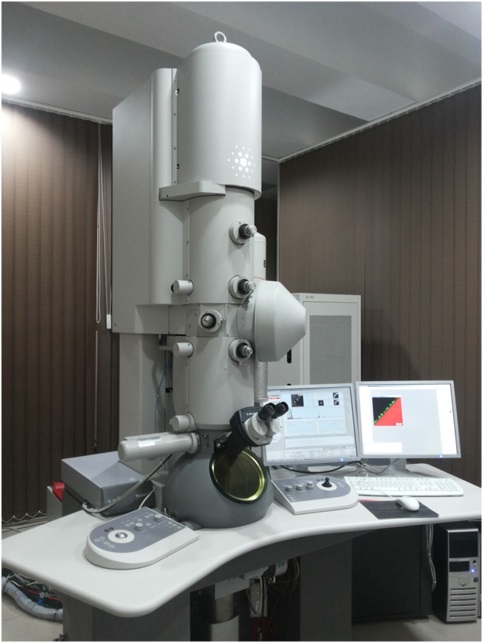 The transmission electron microscope is used to characterize the microstructure of materials with very high spatial resolution. Information about the morphology, crystal structure and defects, crystal phases and composition can be obtained by a combination of electron imaging (2.0 Å point resolution), electron diffraction, energy dispersive X-ray spectroscopy, Electron Energy Loss Spectroscopy with small (~ 1 nm) probe capabilities. The small probe can be positioned on very fine features in the sample for microdiffraction information or analysis of x-rays for compositional information. The spatial resolution for this compositional analysis in TEM is much higher, on the order of the probe size. Conversely the signal is much smaller as sample is very thin and therefore less quantitative. The high brightness field-emission gun improves the sensitivity and resolution of x-ray compositional analysis over that available with more traditional thermionic sources. The transmission electron microscope uses a high energy electron beam transmitted through a very thin sample to image and analyze the microstructure of materials with atomic scale resolution. The electrons are focused with electromagnetic lenses and the image is observed on a fluorescent screen, or recorded on digital camera. The electrons are accelerated at several hundred kV, giving wavelengths much smaller than that of light. However, whereas the resolution of the optical microscope is limited by the wavelength of light, that of the electron microscope is limited by aberrations inherent in electromagnetic lenses. A TEM specimen must be approximately 1000 Å or less in thickness in the area of interest. The entire specimen must fit into a 3mm diameter cup and be less than about 100 microns in thickness. Instrument runs using the TIA interface, and additional software includes: Gatan Digital Micrograph (TIA-embedded version), Xplore3D (tomography package with data acquisition, Inspect3D, TrueImage (focal series reconstruction).